Most people who host a New Year’s party spend the night worrying about red wine spills and ground up appetizers ruining their rug, but few think about spraying champagne all over the house at midnight. 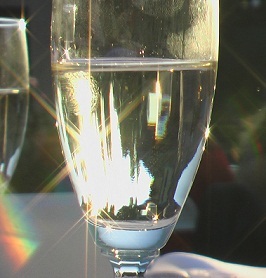 Although champagne is colorless and bubbly, it can still leave behind marks on furniture and other fabrics. Here are some simple tips in removing champagne stains. Add a small drop of dish soap to warm water and mix. Dip a clean, white cloth into the solution and gently dab the stain. Repeat the process until you’ve covered the whole area. Next use a different clean, white cloth and redab the area with warm water to rinse. This method will get champagne stains out of upholstery, carpets and clothing without any added hassle. If only everything in 2013 will be this easy!